The MLS-2000AV Server is a middle-tier package designed as a control system for lighting, irrigation, security, thermostat, AV equipment control as well as to manage music, movies and photos. Any optional driver you purchase at the same time as the MLS-2000AV Server are pre-installed for your convenience. Control: The MLS-2000 Server comes equipped with 4 serial ports to control various home automation and Audio/Video equipment. Reliability: Keeping your automation system up and running is critical. The MLS-2000 comes equipped with dual drives for redundancy. If one fails, the other serves as a backup. Media: Manage your Music and play up to 4 songs simultaneously in different zones. Browse your movies and photos. Note: due to the volatility of the PC component market, and to keep up with ever changing PC technology, Cinemar reserves the right to exchange components for like kind replacement without notice. 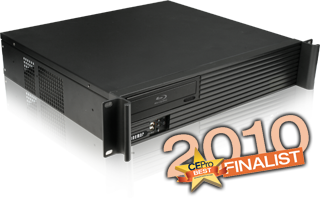 Cinemar server components are warranted by the original respective component hardware manufacturers. Custom Servers and PC setups are available upon request.